From time to time people ask how Sona is doing and how has he adapted to the new place. He is doing very well now, thank you. He was quite freaked out in the beginning, poor thing. All the strange noises, strange light, strange smells... He hid under the blanket with me the first three days as I slept away my exhaustion. As time passed, he also calmed down more, and then he discovered that there's some fantastic stuff going on outside the window. Birds, people, bugs, leaves, sunlight. He likes to sit on the window sill and watch, or try to chase the birds that fly by. I made him a nest next to the window, on top of two boxes of fabric, and he sleeps there during the evening and night. He still prefers to sleep under the bed in the daylight hours. Strange cat, he seems dislike direct sunlight as much as I do. When I play at the iMac in the kitchen, he also comes there, so there's another stack of two boxes of fabric for him to be comfortable on. I'm not quite sure how to make him new and pretty nests, once I decide how to best store my fabrics, but I'll figure something out. Eventually. He seems to be much happier here than in the old place. The sounds are not scary any more (except when someone rings a doorbell) and there are interesting things going on outside. 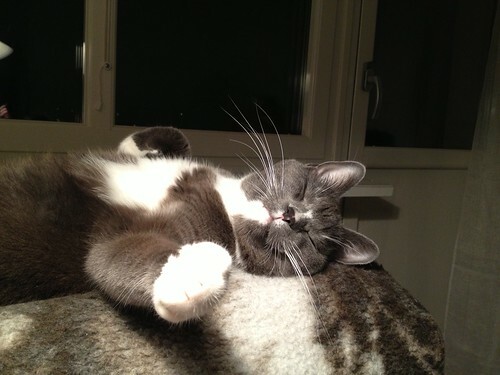 He is a lot more relaxed now, and seems to enjoy his life. That makes me happy and relieved.